Much to the delight of gamers, Blizzard Entertainment finally confirmed Diablo III is in development, and also showed off screenshots and game play during the 2008 WorldWide Invitational (WWI). Rumors have been floating around about a possible Diablo III game for more than a year, but Blizzard -- the subject of an upcoming Activision stockholders meeting regarding its possible absorption into a new gaming empire -- remained secretive about this and other pending projects until just before the weekend. To date, Blizzard has released Diablo, Diablo II, and Diablo II: Lord of Destruction, which have combined to sell almost 20 million copies worldwide. Diablo is credited by many gamers as one of the revolutionary role-playing games of the generation. The entire series focuses on a battle between Heaven and Hell, with Diablo not surprisingly controlling Hell and the demons within. The bland town of Tristram was attacked by demons, with the player's objective being to go and save the town and defeat Diablo and his minions. 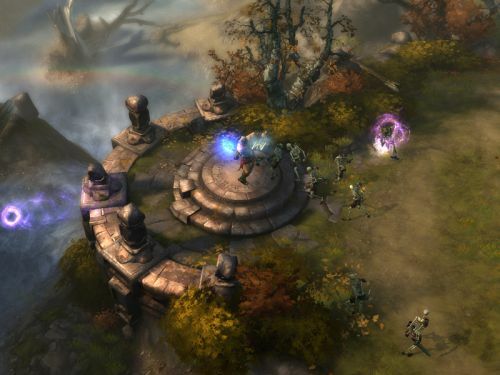 The new game is being built using the Havok physics engine, offering a new twist in how gamers will be able to interact with the Diablo III environment. The destructible environment offers gamers the ability to knock over walls and do similar activities to the floor and surrounding areas. Users will have improved controls, such as a new hotbar where tools and resources can be more readily accessed. The mouse wheel and Tab key will allow gamers to swap between skills and spells quickly. Monsters killed in previous games dropped loot, and this often meant that players with the fastest Internet connection or an automated script would be able to pick up items more quickly than players using the standard controls. So a new loot system will custom-generate loot for each player who was involved in a mission, to more fairly distribute the spoils of war. Diablo III will have a "new and improved" Battle.net that will hopefully reduce the amount of cheating, which was rampant and oftentimes ruined game play in Diablo II. Instead of being forced to lug health potions around, gamers will be able to pick up floating health orbs dropped by slain enemies. Similar to the other Diablo titles, Diablo III will offer online play for free through Blizzard's ad-supported Battle.net network. Cooperative and player vs. player will be available through Battle.net. Blizzard has already unveiled two of the five character classes expected to be in the game, as Barbarian and Witch Doctor were unveiled on Saturday. Previous Diablo titles had a fixed gender for each class, but a male and female model will be available for all five classes. The Barbarian will use brute force to smash and slash his way to victory, while the Witch Doctor can use controllable pets, mind-control spells, fire spells, and life-draining abilities to battle his way through the new version. Diablo II was played through four acts, with each act focusing on a central enemy whom players have to destroy in order to proceed. To get to the bad guy, however, gamers had to play through a series of quests to gain experience. En route to completion, gamers had to kill Diablo; Mephisto, the Lord of Hatred; and Baal, the Lord of Destruction. With hate and waste having already been defeated -- 20 years earlier, according to the game's timeline -- a new group of sin-laden enemies will need to be created for Diablo III. Non-player character Deckard Cain, who has appeared in both predecessors, is the first NPC announced for the new game. Diablo, Diablo II and its expansion were created by the famed Blizzard North studio, but more than 30 employees left Blizzard to create Flagship Studios and Castaway Entertainment, forcing Blizzard to ultimately close the studio and reshuffle its engineers. Diablo III entered development while Blizzard North was still creating game titles, with 50 people now working on the game title. The game will be released simultaneously for Microsoft Windows and Mac OS X systems, and no plans have been released about a console title launch. Similar to other game titles from Blizzard, Diablo III will be released "when it's done." 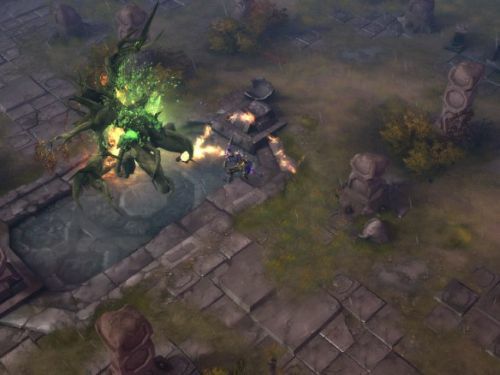 The latest Diablo will likely be released after StarCraft 2 and a new World of Warcraft expansion game, though it is unknown when either game will be released. The Diablo III Web site now features screenshots, game trailer, game play footage and some further details about the game's plot and what gamers can expect.